Weddings are an integral part of our lives as they mark a new beginning. Wedding parties hold a lot of significance too. But sometimes due to various reasons you may have to miss out on a few. 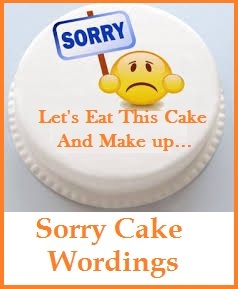 So, sincere words of apologies can make many amends. 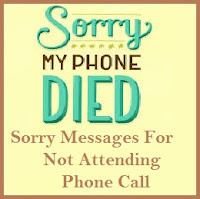 Here is a collection of sample sorry messages for not attending a wedding party. 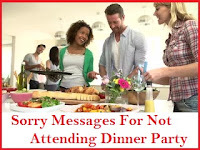 Read on to find the perfect heartfelt sorry message for not attending the wedding party of your freinds or a family memeber. I wish you a very happy married life my dear, but I am extremely sorry that I will be out of the country at that time and will have to give a miss to your wedding party. My heartfelt apologies to you. I know you will never forgive me for not being able to be at your wedding party. I deserve every punishment. I can’t tell you how bad I am feeling for not being able to attend your wedding party. If it wasn’t for that wretched flight that landed eight hours late and spoilt it all for me. I am really sorry my dear. I had been planning to come to your wedding party since a month and here I am in bed with a viral infection that refuses to go away. I am so sorry for my absence. You were planning this wedding for months and I was dying to be there on your special day as an most helpful wedding guest but I feel so rotten in telling you that I won’t be there that day as I have to join a new job in another city. Your wedding means so much to me but I feel horrible in telling you that I may not be here to attend your party I am tending to my sick father. It was your biggest day and I couldn’t be there to share your happiness. I will always miss being at your wedding. Can I ask you to forgive me? Please? I am at your mercy for forgiveness as I couldn’t be a part of your wedding celebrations due to a number of reasons which I promise to explain when I meet you which is going to be very soon. I don’t know if you will ever excuse me for not making it to your wedding party? I deserve any punishment that you deem fit for my offence. If only my office was a bit considerate, I would be at your wedding celebrations. You will please have to forgive me for this. I wish I was there for your wedding party but for various reasons. Hope you will forgive me in due time. If I wasn’t your ex I would have certainly been at your wedding party as a wedding guest. Hope you would understand my absence. All the same please accept my apologies. I am sure it was a blast wedding celebration. Congratulations for both of you, it is unfortunate that I it. I am so sorry that I was not able to come because of my health reasons. 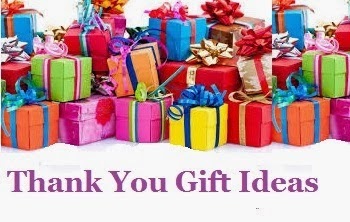 As you know, I have been in and out of the hospital for the recent months. You are in my prayers always. Best wishes. My full attire for your wedding are ready for the wedding day, but with unfortunate incident happened in the family , I was not able to come. My sincere apology to both of you, I wish you a blissful marriage together. Being one of your closest friends, I felt bad that I was not able to attend your wedding. Reggie my son had been sick again and I thought he will be better soon. Michelle told me that it was a blast! I am happy for you my friend. I am inviting you and your husband Harry to a simple dinner get-together at my house at your availability date to catch up. Being in your entourage means a lot to me, you have chosen me to be one of your bridesmaid that is why I am so sorry that I was not able to attend last (wedding date) to witness the ceremony. I hope to be a good and supporting friend in your entire marriage life. I am sorry in advance that I cannot attend your wedding on (wedding date). Our company is sending me to an important out of country training in Germany that I cannot miss. Together with this note is my my advance wedding gift. I will pray for the success of your wedding day. I have seen the photos of your wedding through Charles who attended your wedding. The photos shows that you had a wonderful wedding day, I felt bad that I am not part of it. 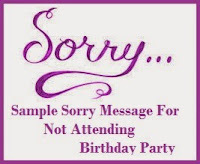 This messaage is quite late, I am sorry for not attending your party. I feel terrible missing your party. Wishing you both the best of luck. I wish I could have been there to witness you special moments in your wedding day. I regret that I was not able to come. I am sorry. I am honored to be one of your guests and I got excited when I received the wedding invitation. Unfortunately, I need to attend to my daughter’s graduation which is scheduled same with your wedding day. I wish both of you a successful wedding event. You look great together, I am sorry that I cannot be present on your wedding day. Wishing you happiness and a great life together. I am so sorry that I cannot be on your wedding day physically, but I am always there in spirit. I apologize I cannot come. Warm wishes to both of you, I am proud of the kind of relationship you have for each other that is why I am so happy when I heard the big news. Please accept my apology for not attending your wedding. 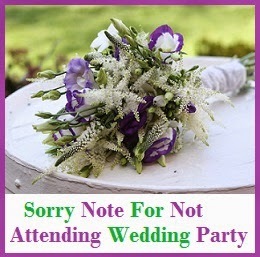 My heartfelt sorry for not attending your wedding party. I hope I can make-up to both of you soon. My deepest apology for not attending your wedding ceremony and party. I am scheduled to fly back two days before your wedding date, but there had been a problem with my flight bookings. Again, I am sorry. I miss one of the special days of your life, I am really sorry for not attending. I appreciate the wedding invitation you but I am sorry I failed to come on your wedding. Please accept my utmost apology.